At a time when physical, religious, racial, cultural, and economic borders divide the population of our planet, efforts to bridge those borders should be appreciated. In that spirit, Cinema Without Borders presents Bridging the Borders Award to the films that are most successful in bridging and connecting the people of our world closer together. Bridging The Borders Award is offered at Palm Springs International Film Festival, Palm Springs International ShoerFest Film Festival, Southeast European Film Festival, LA and Polish Film Festival, LA. Bridging The Borders Award is sponsored by GoEnergistics. Cinema Without Borders is planning a yearly awards event to award the films, directors, producers, writers, composers, directors of photography and actors of international cinema. We will announce more details on this matter very soon. Burbank, Ca — February 8, 2018 — At Cinema Without Borders, we are thrilled to announce Go Energistics as the new sponsor of our Bridging The Borders Award. The humanistic goals of GoE executives, their broad vision of how people of our world should come together, and their understanding of how the art of filmmaking bridges over invisible borders makes them the perfect match for the Bridging The Borders Award. The Bridging The Borders Award, sponsored by Go Energistics, will be offered at the Palm Springs ShortFest International Film Festival, The Southeast European Film Festival – Los Angeles, The Polish Film Festival – LA, The Hungarian Film Festival, LA, and The Palm Springs International Film Festival. 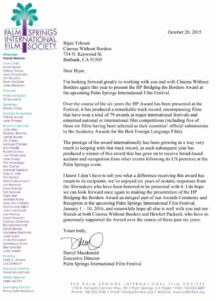 Adam Shepherd and Miles Harrison, owners of GoE have expressed their support for Bridging The Borders Award: ” I am honored and delighted to support “Cinemas Without Boarders.” It is such a worthy organization that impacts and changes people’s perceptions of the difficult plights of so many in our world. Your personal passion and commitment to promoting, through the Arts, these talented film-maker’s story-telling makes a huge difference. “, Adam Shepherd. “I am passionate about promoting the arts and consider it a great privilege to be a champion for social awareness in our country. It’s truly an honor to accept our role as the Bridging the Borders Award sponsor.”, Miles Harrison. Miles has over 30 years of experience in global project delivery to more than 50 Department of Defense and 75 private sector healthcare facilities. 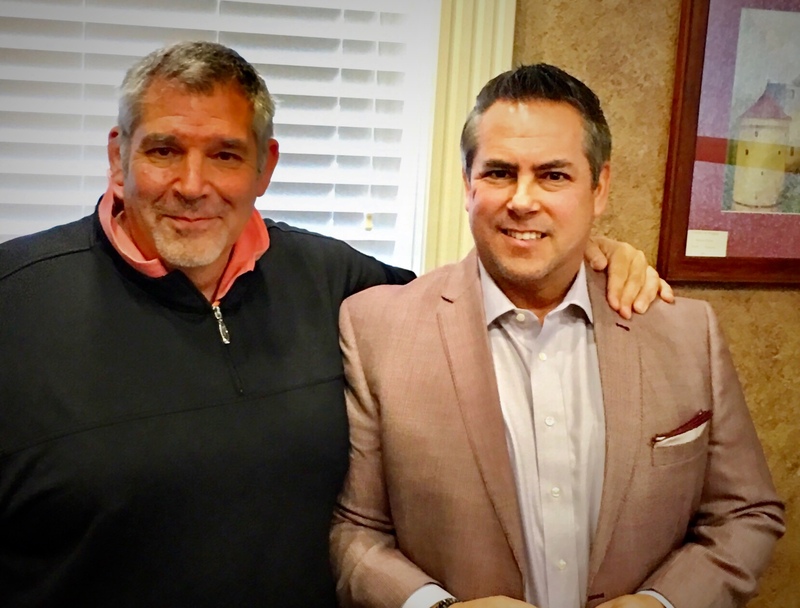 Adam has managed numerous high visibility projects including logistics integration for the 2005 Department of Defense and has served in logistics in numerous combat zones including the Czech Republic, Southwest Asia, Kuwait, and Iraq. Miles lives in the Washington DC area and has a Master’s Degree from Ohio State University, Graduate School of Public Affairs. He advocates on Capitol Hill for child safety in automobiles. Adam resides in Dallas, Texas and has a Bachelor’s of Administration Degree from Texas Tech University. His awards include the Military Bronze Star and the Defense Meritorious Service Medal. Adam serves on the Board for the Yellow Ribbon Fund which supports wounded warriors and their entire family with the burden and costs of healing. Miles and Adam consider it an honor to be advocates for social awareness in our country. Ave Maria from Palestine; Directed by Basil Khalil. winner of Bridging The Borders Award at 2015 Palm Springs ShortFest later in 2016 was nominated for the Live Action Short Film Oscar. Walesa. Man of Hope, directed by legendary Andrzej Wajda, won Bridging The Borders Award in 2014 at the Palm Springs International Film Festival and later was announced as the Polish entry for the Best Foreign Language Film at the 86th Academy Awards. Terraferma an Italian drama directed by Emanuele Crialese won Bridging the Borders Award at 2012 Palm Springs International Film Festival and was premiered at the 68th Venice International Film Festival. Terraferma was selected as the Italian entry for the Best Foreign Language Film at the 84th Academy Awards, and won several awards at major international film festivals. The Band’s Visit won Bridging the Borders Award in 2008. This film was Israel’s original Foreign Language Film submission for the 80th Academy Awards, but was rejected by the Academy of Motion Picture Arts and Sciences because it contained over 50% English dialogue. It has won Un Certain Regard – Jury Coup de Coeur – Cannes Film Festival and Feature Film Award – Montreal Film Festival. French from France, directed by Josza Anjembe won 2016 l Bridging the Borders Award 2016 in Palm Springs ShortFest and now by winning other awards in 2017, will be considered for an Oscar in Live Action Short section. I’m looking forward greatly to working with you and with Cinema Without Borders again this year to present the HP Bridging the Borders Award at the upcoming Palm Springs International Film Festival. Over the course of the six years the HP Award has been presented at the Festival, it has produced a remarkable track record, encompassing films that have won a total of 79 awards at major international festivals and esteemed national or international film competitions (including five of those six films having been selected as their countries’ official submissions to the Academy Awards for the Best Foreign Language Film). The prestige of the award internationally has been growing in a way very much in keeping with that track record, as each subsequent year has produced a winner of this award that has gone on to receive broad-based acclaim and recognition from other events following its US premiere at the Palm Springs event. 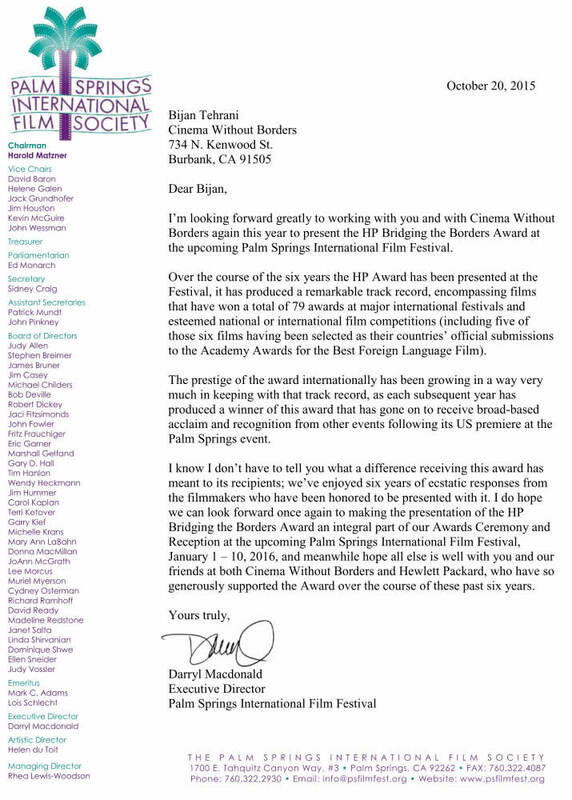 we can look forward once again to making the presentation of the HP Bridging the Borders Award an integral part of our Awards Ceremony and Reception at the upcoming Palm Springs International Film Festival, January 1 – 10, 2016, and meanwhile hope all else is well with you and our friends at both Cinema Without Borders and Hewlett Packard, who have so generously supported the Award over the course of these past six years.